Energy is in short supply in south India as well as in other parts of the Third World. Conventional methods of energy production are expensive and often harmful to the increasingly fragile environment. Aurovilians have explored ways of generating non-polluting, renewable, and affordable energy appropriate to local conditions. 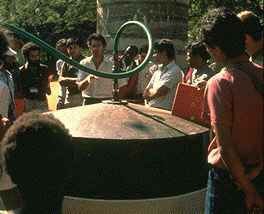 There are at present 30 water-pumping windmills of various designs working in Auroville. Aurovilians have manufactured prototypes of an improved design with wider applicability in India. They have also integrated numerous solar and biogas systems into community life. The Centre for Scientific Research (CSR) was created in 1984 to fund and promote research in alternative technology in Auroville. CSR is currently coordinating a government-sanctioned energy project; providing biogas plants, solar cookers, and improved cooking stoves for local villages; as well as producing prefab building components for rural housing.